Over the winter holiday, we watched a lot of the Great British Baking Show. Like, a lot a lot. It wasn’t long before we’d watched every single season. To cope with the lack of new episodes, I’ve been baking recipes from the show. It’s inspired me to actually try my hand at baking (something I’ve always been terrified of)… especially working with yeasted doughs. Since going zero waste, the idea of baking was a bit more daunting than say, throwing together a vegetable curry. I didn’t think it’d be possible to procure all the necessary ingredients in large enough quantities to actually bake something tasty. 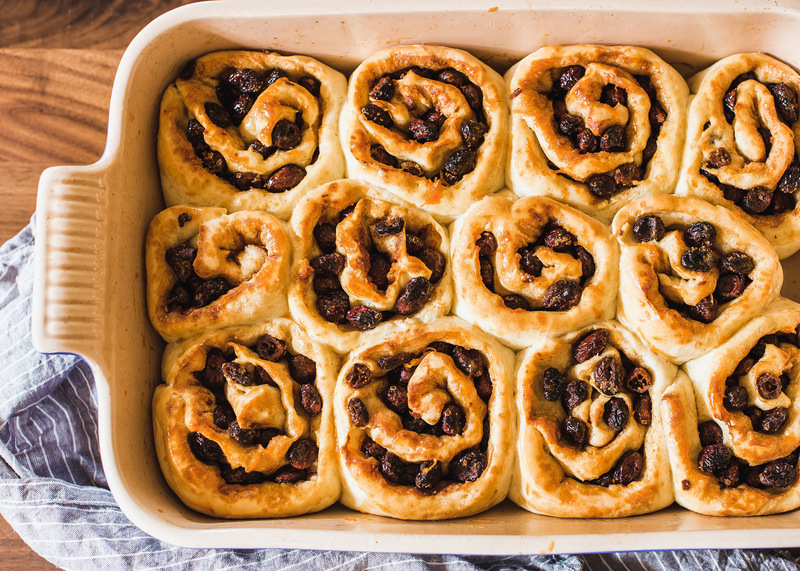 Over the last few months, I’ve been baking pretty much nonstop and finally got up the nerve to try making Paul Hollywood’s famous Chelsea Buns. Let me tell you, they’re a bit of a labor of love but they do not disappoint. The dough is really nice to work with. You’ll find the recipe below, which includes helpful tips on how to purchase and/or make the ingredients virtually 100% zero waste. Make the dough: Melt 40g butter and milk over low heat. Let cool to lukewarm. Mix flour and salt together in a large bowl. Make a well in the center and add the yeast. Pour in the milk, butter, egg and mix well. Turn dough out onto a lightly floured surface and knead for 5 minutes until the dough is smooth and elastic. Shape into a ball and place in a large greased bowl. Cover with a damp kitchen towel and let sit until doubled in size (40 mins to an hour). Prepare the filling: Melt 25g butter in same pan you used previously. Set aside. Measure out the rest of the ingredients. Grease a high-sided baking pan thoroughly with butter. Roll out the dough & fill: Tip the dough out onto a lightly floured surface and roll out to a rectangle (about 12in x 8in). Brush on the melted butter. Evenly cover with the orange zest, brown sugar, cinnamon and dried fruit. With the long end of the dough facing you, roll the far end toward you as tightly as possible. Slice into 1½” rounds and place, cut-side up onto the prepared baking pan. Place rounds ½” apart to give them space to rise. Cover with the damp cloth again and wait about 30 minutes. Bake: Preheat oven to 375 degrees F. Bake the buns for 25-30 minutes. Rotate once in the middle of the cook time so they brown evenly. Remove and let cool slightly before glazing. Glaze: Over low heat in the same pan you used earlier, mix 1-2 tbsp powdered sugar with a few splashes of water and the remaining orange zest until everything is incorporated. Remove from heat, let cool slightly and drizzle generously over the buns. Except for the butter, which comes in paper boxes (recycled) and wrapped in wax paper (composted), the rest of the ingredients can be purchased completely package free if you can find them! If you can’t find some of these things, you may be able to make them. Milk – we have milk that comes in glass bottles. Pay the bottle deposit when you purchase the milk and receive the deposit back when you return the empty bottle back to the store. Honestly can’t believe I waited so long to write about this discovery. It’s so easy! Yields 3 cups powdered sugar. Add sugar and cornstarch to a high-powered blender. Pulse at medium speed 10-15 times, or until mixture is fully incorporated.